Cervat Yerli, head of Crytek, says that he wants people to associate the Crysis brand with 3D gaming. High-definition HD gaming is still in its infancy, but Yerli thinks it's here to stay and wants to make sure that Crytek is there from the beginning. In his opinion it's only a matter of time before the 3D capable TVs are widespread, and developers start tapping into that new audience. In Yerli's mind, the release of Crysis 2 - which he views as something of a re-launch of the series because it's the first time console gamers will get to play a Crysis game - is the perfect opportunity to associate the series with the 3D experience. But he doesn't want to do 3D gaming just for the sake of doing it and says that he wants to use 3D to make a really special experience. "We want to turn the TV as well as the monitor in to a window into a new world," he said. "Once people play in 3D the way we've demonstrated, I don't think they'll want to not play in 3D ever again." Yerli isn't expecting that every developer will embrace the technology instantly, and thinks that the audience for it will start off relatively small. He believes, however, that there will be some big games that use it and benefit from it. Yerli admits that the current high price of 3D TVs is a barrier, but considers that to be a temporary setback, rather than an insurmountable obstacle. "As soon as the first affordable 3D TVs arrive," he said, "I think it's a no-brainer at that point, everyone will adapt." 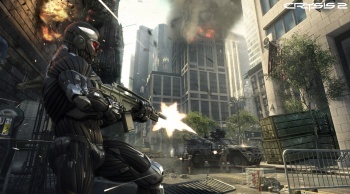 Crysis 2 is scheduled for release early next year.